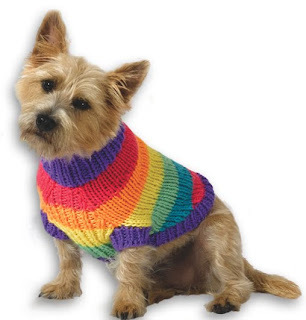 Knit a cute and comfortable sweater for your dog in a rainbow of colors. This dog sweater knitting pattern is for intermediate knitters. Gauge: 14 sts and 18 rows = 4” (10 cm) in St st (k on RS, p on WS) with one strand each MC and CC held tog on larger needles. BE SURE TO CHECK YOUR GAUGE. Chest measurement 14 (18, 22, 26)"
Finished sweater measurement 15 (19, 23, 27)"
The instructions are written for smallest size. — 24 (38, 44, 48) sts. Work even until piece measures 12 (16, 21, 23)" from beg. Bind off all sts loosely. Beg at neck opening with two strands of Color A and smaller needles, cast on 7 sts. Following color pattern (B, C, D, E)* work in K1, P1 Rib, inc 1 st each end every 3rd row 7 (9, 13, 16) times – 21 (25, 33, 39) sts. Work even, following the color pattern, until piece measures 8 (12, 16, 17)" from beg. Bind off all sts loosely. Sew Underpanel to Back leaving a 2 (21⁄2, 3, 31⁄2)" space on each side for front leg openings at the widest point of Underpanel. When sewing panels together make sure stripes match. With double-pointed needles and two strands of Color F, pick up and knit 44 (58, 72, 76) sts evenly around neck opening. Place marker, join, and work in K1, P1 Rib for 3" or desired length. Bind off all sts loosely.